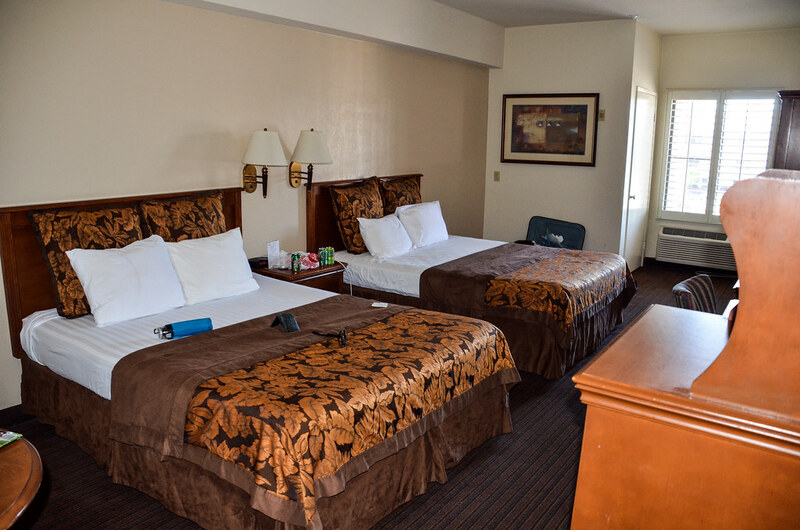 Anaheim Desert Inn & Suites is a Disneyland Good Neighbor Hotel that is about a 5-minute walk to Disneyland. We recently stayed at this hotel and thought it was perfectly suitable for our needs. In this review, we’ll cover the rooms, amenities and location of Camelot Inn and Suites. As you can see below (thanks to Google) the hotel is directly across the street from Disneyland. Desert Inn and Suites is in the bottom right corner of that photo. The IHOP is about where the cross walk over to Disneyland is so, as you can see, the walk to Disneyland is very short. That is the biggest positive to the Desert Inn & Suites. From what I can tell this is one of the three closest hotels to the parks. Going back to our room in the middle of the day was no problem at all and didn’t waste much time. Harbor Boulevard is full of motels/hotels and all of these are fairly close to Disneyland. Some are absolutely nicer than others but the main thing all of these hotels have going for them is location. Over the last decade many of these hotels have received renovations, making Harbor Blvd. much nicer than it used to be. That trend will continue as Disney has bought some land in this area and is planning on building a parking garage plus more. In case you missed my recent trip report, our stay here involved a lot of people. While there are plenty of basic rooms at this hotel, we had six people in our room and could have fit another 3 or 4 comfortably. This was a nice accommodation for those looking to fit in a big group. Those rooms ranged from $180-$250 per night, based on the time of year. Basic rooms start around $100 and go up to $150 during peak times. This is a basic room with 2 queen beds, a bathroom and TV. The sink is outside the bathroom, which I always appreciate when sharing a hotel room with others. As you can see, there’s a refrigerator and microwave. There’s also a table and chairs out of the shot in the entrance to the room. The TV isn’t very big but was nice enough and had the usual channels. The beds were fairly comfortable. The mattresses weren’t too hard or soft, either way. It wasn’t the most comfortable bed I’ve slept in but I had absolutely no problems with it. The bedding was fairly average. The sheets weren’t scratchy but they weren’t the softest. I there’s one complaint with the room, it’s that I think it’s fairly ugly. There’s a whole lot of brown here and the room wasn’t very bright. While I don’t tend to care very much about the color scheme in the room, I definitely wouldn’t give this room high marks as far as being pleasing to the eye. Still the room was perfectly comfortable, had adequate space and comfortable bedding. It was also very clean and taken care of. 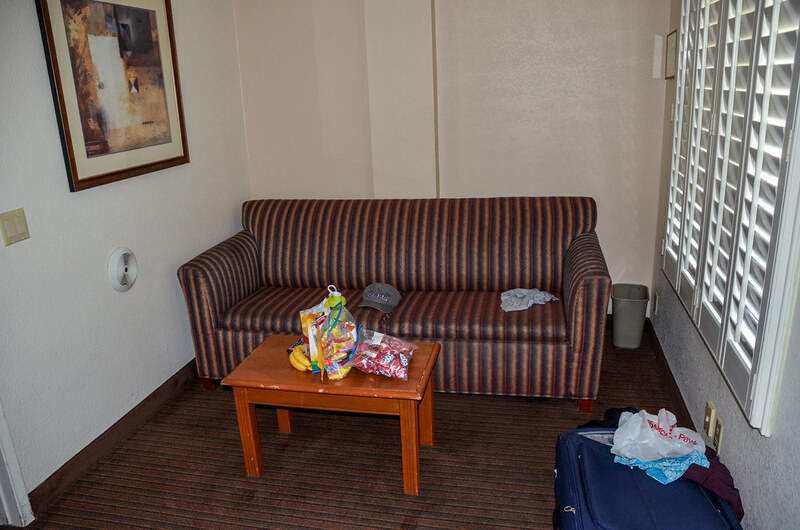 Here is the front room (there were 2 bedrooms attached to this) that had a couch and TV. The couch was not comfortable at all, but it did pull out to a bed. We didn’t try the bed. The TV here was the same size as in the bedroom. Still quite a bit of brown going on in this room and while it was nice to have a separate space from the bedrooms, this room didn’t add a lot for me. The bathrooms (2 in this room, 1 in the standard) were run of the mill motel bathrooms. There was a shower/bath combo and, as I mentioned the sink was outside of the bathroom. There wasn’t a ton of space in there but again, it was adequate. 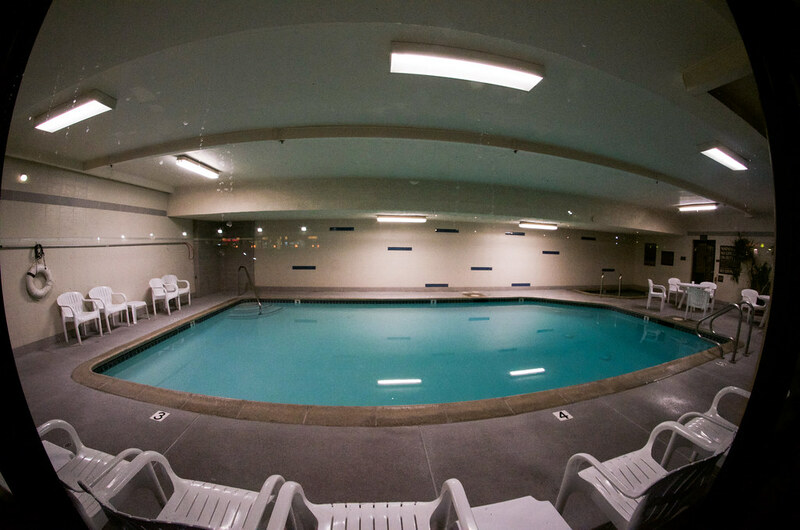 As far as amenities, there was a pool and hot tub. Both were indoors so it’s protected from those 10 days a year it rains in Southern California. The pool was a normal size, as was the hot tub. The pool was fairly cold but I don’t know if it’s consistently that way. The pool was very clean. The hotel served a continental breakfast that had very limited options. There was some fruit, cereal, pastries and bread. That’s about it. 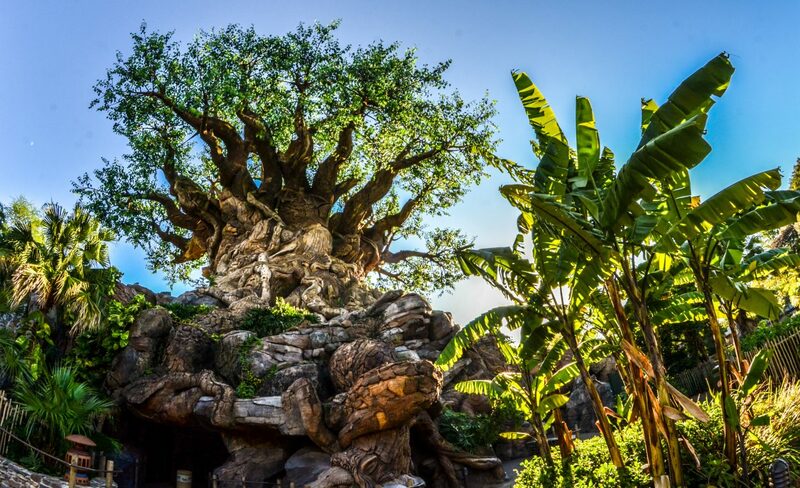 If you want to grab something for your way to the parks, then this is suitable. If you want a good breakfast, go somewhere else. This is a nice way to save a few bucks though. There was a Denny’s right across the parking lot from the hotel. A Cold Stone, IHOP and the dreaded Captain Kidd’s were also very close by. 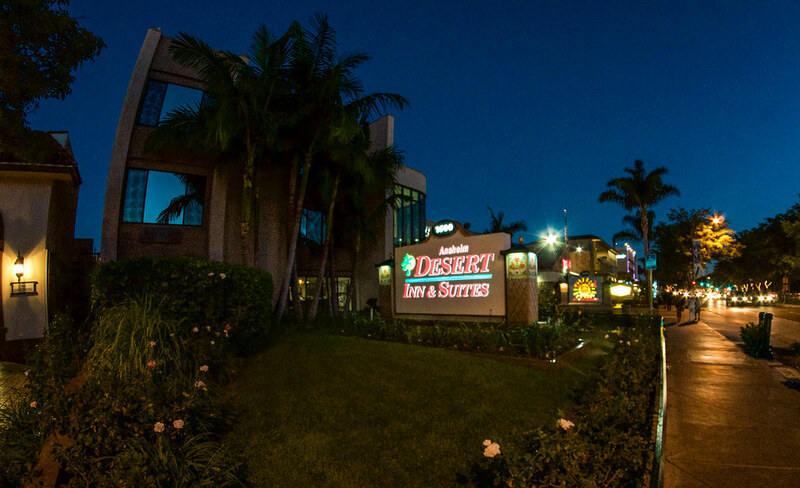 What you ultimately think about Anaheim Desert Inn & Suites will come down to how much you care about location. I care a lot about it and therefore I think this is a pretty good hotel in terms of value. If you’d rather stay somewhere nicer then you’ll be sacrificing location or cost for that need. 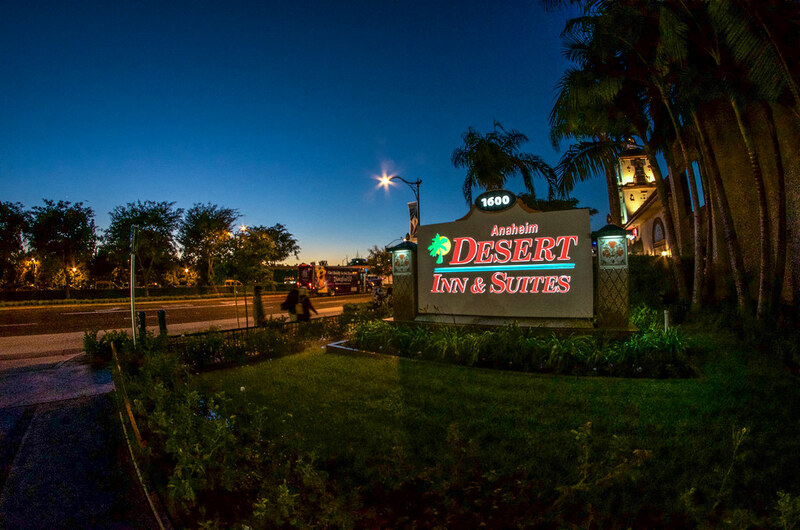 Take out location and relative value, and Desert Inn & Suites is nothing special. Add it in and it becomes one of the better Disneyland Good Neighbor Hotels. Out of the three we’ve stayed at, I would place Desert Inn & Suites. Melissa like the Camelot Inn a little bit more, which I think is fair. Both are very close in my mind. If you have any questions about this hotel, or Disney Parks in general, please let me know in the comments! Thank you for reading!